(Right) Photograph of General Joseph Shelby. Courtesy United States Marshals Service. Joseph Orville Shelby was born on December 12, 1830 in Lexington, Kentucky, to one of Kentucky's wealthiest and influential families. “Jo” Shelby attended Transylvania University and was engaged in rope manufacturing until 1852. Then, he moved to Waverly, Missouri, and engaged in various enterprises including steam-boating on the Missouri and a plantation. Being successful, Shelby became a member of the Missouri's social and political elite. During the Missouri-Kansas Border War, he participated in several "Border Ruffians" invasions of Kansas. With the outbreak of war in Missouri in 1861, Shelby raised a cavalry company for the Missouri State Guard and served as its captain. While in the Missouri State Guard, Captain Shelby saw action at the battles of Wilson's Creek, Lexington, and Pea Ridge (Elkhorn Tavern). Shelby transferred to the Confederate Army in the spring of 1862 and went with General Sterling Price east of the Mississippi River. In 1862-63, Shelby took part in the expedition against Springfield, also capturing the federal garrisons at Neosho, Greenfield, Stockton, Hermanville, Warsaw, Boonville and Marshall, Missouri. Frank and Jesse James and James and Cole Younger served with Quantrill's Raiders during the Civil War and they saved General Jo Shelby from capture on December 7, 1862, at the Battle of Prairie Grove. The expedition resulted in the recruitment of a thousand-man cavalry regiment. For this accomplishment, Shelby was promoted to colonel and put in command of a cavalry brigade under Major General Hindman. 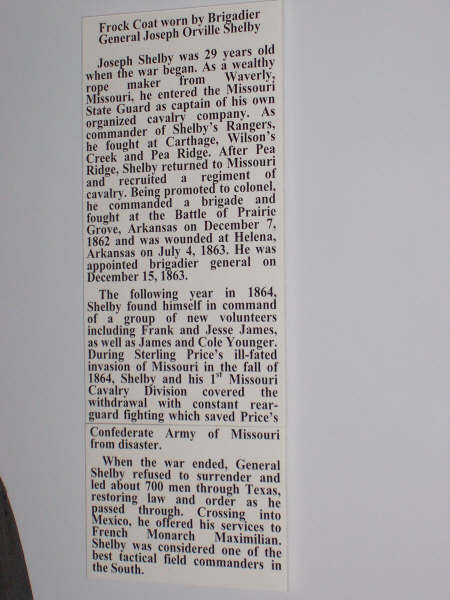 Colonel Shelby played an important role in the Battle of Prairie Grove, Arkansas. 1863 proved to be a very busy and rewarding year for Shelby. He was part of General Marmaduke's raid into Southeast Missouri, participated in the Battle of Helena, Arkansas, and conducted an independent raid into Central Missouri. The latter activity gained Shelby notoriety and fame throughout the Confederacy. Shelby's Raid, which began on September 22, 1863, with 600 men, covered fifteen-hundred miles and resulted in the destruction of $1,000,000 worth of Federal supplies and $800,000 of railroad property. Shelby also returned with 6,000 horses and mules and 800 recruits from Northern Missouri. The raid, consequently, may have prevented 10,000 Federal troops from reinforcing Gen. Rosecrans after his defeat at Chickamauga. This was no small feat for a general let alone a colonel. Thus, Shelby earned the rank of brigadier general. During the fall of 1864, he captured Potosi, Missouri, destroying the railroad. After bloody fighting, he captured Boonville, Waverly, Lexington and California, Missouri. General Shelby's "Iron Brigade" engaged in the Battle of the Little Blue and Westport and twice saved the army from utter ruin. Missouri Confederates held General Shelby in the highest esteem and referred to him as the greatest Missouri soldier of the Confederacy. General Shelby's "Iron Brigade" greatly contributed to General Price’s successful campaign against General Steele when Steele attempted to occupy Shreveport, Louisiana. Price sent Shelby into Northeast Arkansas to prepare for the upcoming raid into Missouri (Price's Raid). Once again, Shelby's recruiting efforts were successful. He returned from this mission with 8,000 recruits, a portion of which were added to his command. During Price's Raid, Shelby did not participate in the defeat at Pilot's Knob. He had been detailed to raid a railroad. After Price's Raid, only Shelby's "Iron Brigade" remained effective and provided the cover for the retreating forces. Shelby refused to surrender in 1865. 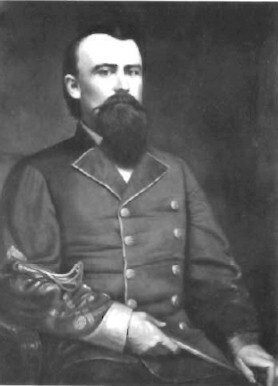 He planned an attempt to prevent General E. Kirby Smith from surrendering at Shreveport, Louisiana, but muddy roads prohibited the plan. After Smith's surrender on May 26, Shelby and several hundred of his Iron Brigade went to Mexico. When crossing the Rio Grande, Shelby ceremoniously buried his unconquered flag. He offered the service of his men to the Mexican Emperor Maximilian; who declined the offer because he did not want to offend the United States. Shelby then established a wagon freight company near the Confederate exile colony of Carlota in the state of Vera Cruz. This enterprise thrived until guerrilla raids and the withdrawal of the French Army (the support of Maximilian) forced Shelby to return to Missouri in the summer of 1867. Consequently, Shelby began growing wheat near Lexington, and promoting railroads and operating coal mines. In 1893, Shelby was appointed Eleventh U.S. Marshal for the Western District of Missouri by President Grover Cleveland. Shelby held that position until his death on February 13, 1897. Newspapers from the east, however, had adverse comments regarding the appointment of General Shelby. One U.S. Senator was quoted as saying: "Nearly thirty years have elapsed since the termination of the war. All that one can ask, even the most loyal Unionist, is that the government shall not be confided to men who, during that awful time, represented not fair battle, but rapine, cruelty and chaos. We, or most of us, believe Jo Shelby belonged to the latter class. Still, we can do nothing to prevent the consummation of the outrage in making such a man the representative of law and order. All we can do is to enter our solemn protest." 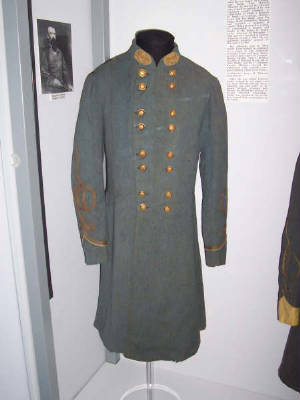 (Right) General Shelby's frock coat. This handsome frock coat is in outstanding condition and has minimal signs of wear. The condition indicates that Shelby wore this coat rarely and that it was preserved well. Photographed by the writer. Courtesy Texas Civil War Museum. During his tenure, the Great Pullman Strike occurred in 1894, which was one of the most famous civil disturbances of the 19th century. U.S. Marshal Joseph "Jo" Shelby died in Bates County, Missouri in 1897. He is interred in the Forest Hill Cemetery at Kansas City. Recommended Reading: Black Flag: Guerrilla Warfare on the Western Border, 1861-1865: A Riveting Account of a Bloody Chapter in Civil War History. Editorial Review (Library Journal): The Civil War on the Kansas-Missouri border was initially fought by Bushwhackers and Jayhawkers, guerrillas from Missouri and Kansas, respectively. Union troops mostly displaced the Jayhawkers by 1862, but the Bushwhackers remained active until Lee's surrender. Historian Goodrich describes the death and destruction the guerrilla war wrought on this region through excerpts from diaries, letters, [photos], local news accounts, and published articles, letting the victims do most of the talking. Citing cases that graphically underscore the terrorism, Goodrich captures the fear of the populace. …There are a number of recent regional publications on this topic that do not achieve Goodrich's scope. This title should be considered for public libraries with strong Civil War collections. Continued below. Recommended Reading: Generals in Gray Lives of the Confederate Commanders. Description: When Generals in Gray was published in 1959, scholars and critics immediately hailed it as one of the few indispensable books on the American Civil War. Historian Stanley Horn, for example, wrote, "It is difficult for a reviewer to restrain his enthusiasm in recommending a monumental book of this high quality and value." Here at last is the paperback edition of Ezra J. Warner’s magnum opus with its concise, detailed biographical sketches and—in an amazing feat of research—photographs of all 425 Confederate generals. Continued below. Recommended Reading: Generals in Blue: Lives of the Union Commanders (Hardcover). Description: More than forty years after its original publication, Ezra J. Warner’s Generals in Blue is now available in paperback for the first time. Warner’s classic reference work includes intriguing biographical sketches and a rare collection of photos of all 583 men who attained the rank of general in the Union Army. Here are the West Point graduates and the political appointees; the gifted, the mediocre, and the inexcusably bad; those of impeccable virtue and those who abused their position; the northern-born, the foreign-born, and the southerners who remained loyal to the Union. Continued below. Warner’s valuable introduction discusses the criteria for appointment and compares the civilian careers of both Union and Confederate generals, revealing striking differences in the two groups. Generals in Blue is that rare book—an essential volume for scholars, a prized item for buffs, and a biographical dictionary that the casual reader will find absorbing. Sources: Major General Joseph Orville Shelby, Governor's Guard (Jefferson City, MO), March 1995; Jay Monaghan, Civil War on the Western Border, 1854-1865. Lincoln, Nebraska: University of Nebraska Press, 1992; John H. Eicher and David J. Eicher, Civil War High Commands, Stanford University Press, 2001; Maj. General J.O. Shelby Camp # 191, Warrensburg, Missouri; United States Marshal Service; Daniel O'Flaherty, General Jo Shelby, Undefeated Rebel; Stewart Sifakis, Who Was Who In The Civil War; Official Records of the Union and Confederate Armies; National Park Service: American Civil War.